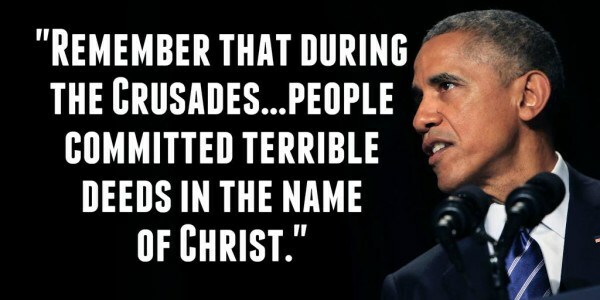 So, Obama made a crude comparison between ISIS and the Crusades which shocked and confused a lot of people. Why would he do this? It's simple, it's a distraction. With all the rising tide of Islamic violence in the Middle East, and Western countries, you might be tempted to think there is something uniquely violent in Islam. "And lest we get on our high horse and think this is unique to some other place, remember that during the Crusades and the Inquisition, people committed terrible deeds in the name of Christ... So this is not unique to one group or one religion". He doesn't want you to think this violence is unique to Islam. Why? Because Obama's identity is partly Muslim. He comes from a Muslim family, he lived in Muslim countries, and has an Arab middle name. And what might happen if we open the Koran and read it for ourselves? We might find that the terrorists have a very credible interpretation of Islam, whereas the moderates have the weaker interpretation. 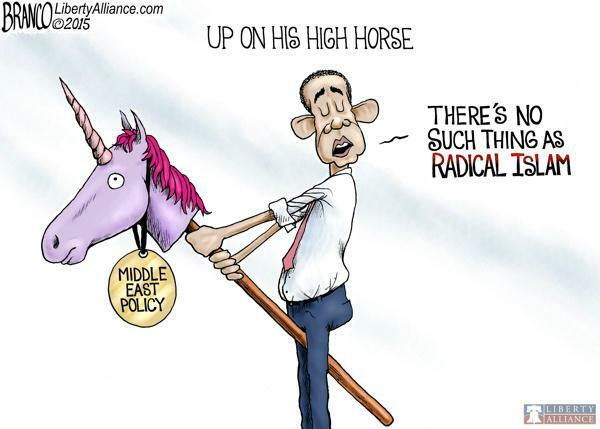 And that would be humiliating for all moderate Muslims, and for Obama with his Muslim heritage. We know from Obama's speeches to Muslims, and his outreach through NASA, that his overriding goal is to make Muslims FEEL PROUD of themselves, to raise their heads high. But investigating Islam risks exposing moderate Muslims to the humiliation that (a) the terrorists might be the true Muslims and thus (b) moderate Muslims might be ignorant fools, and flag bearers for a truly repulsive head-chopping religion. That would take thin-skinned Obama and his Muslim buddies back to being humiliated, the very thing he's trying to run away from. But the problem with saying "don't think this is unique to Islam", is that you've mentioned the elephant in the room, and you've instantly brought everyone's attention to it. But part of what I want to touch on today is the degree to which we've seen professions of faith used both as an instrument of great good, but also twisted and misused in the name of evil. And, finally, let’s remember that if there is one law that we can all be most certain of that seems to bind people of all faiths, and people who are still finding their way towards faith but have a sense of ethics and morality in them -- that one law, that Golden Rule that we should treat one another as we wish to be treated. The Torah says “Love thy neighbor as yourself.” In Islam, there is a Hadith that states: "None of you truly believes until he loves for his brother what he loves for himself.” The Holy Bible tells us to “put on love, which binds everything together in perfect harmony.” Put on love. 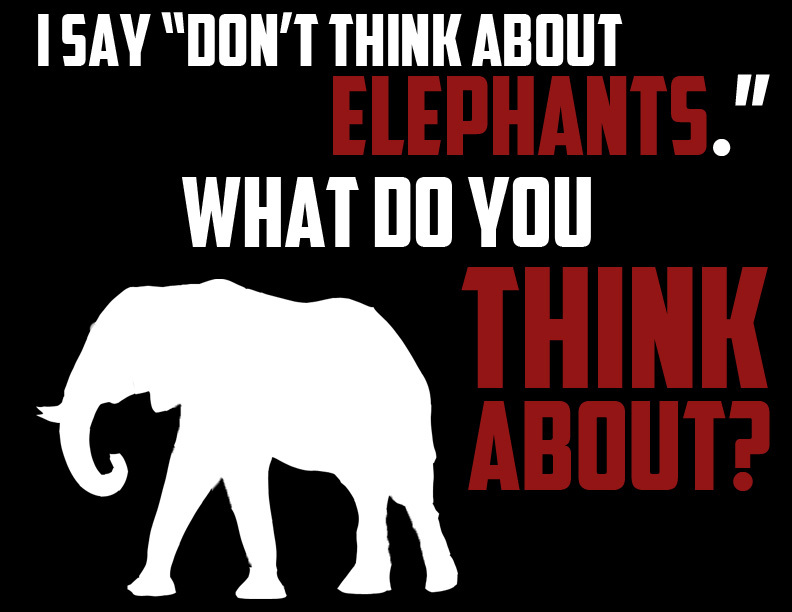 File under: don't think of an elephant.